The Min/Max inventory ordering method is a basic reordering mechanism that has been implemented in many ERPs and other types of inventory management software. 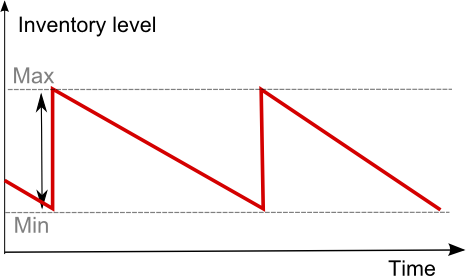 The “Min” value represents a stock level that triggers a reorder and the “Max” value represents a new targeted stock level following the reorder. The difference between the Max and the Min is frequently interpreted as the EOQ (Economic Order Quantity). And while Min/Max inventory planning is quite a crude method for inventory ordering, Min/Max settings can be dynamically adjusted to offer better inventory performance. The Min/Max method was one of the earliest automated inventory replenishment methods to be used in enterprise software dedicated to inventory management. The primary benefit of this method is its extreme simplicity of implementation. This method tracks the current total stock level, which is typically the sum of the stock-on-hand plus the stock-on-order for every single SKU. When total stock reaches the Min value, a reorder is triggered. The reorder quantity targets the Max value for the new total stock level, hence the reorder quantity is the difference between Max and Min (i.e. Max minus Min). In its original form, Min/Max ordering was considered to be a fairly static method of inventory control where the Min/Max values were rarely changed, maybe a few times per year. The ABC Analysis was frequently used to guide practitioners to spend more time revising the “A” items which traditionally require more attention than “B” or “C” items. One of the challenge faced by companies seeking to optimize their inventory is that their current inventory management software does not necessarily offer any kind of advanced predictive logic aimed at constantly and automatically adapting the Min/Max values. However, the Min/Max system is not a blocking issue in itself. Indeed, assuming that another software, dedicated to inventory optimization, is capable of overwriting the Min/Max values on a daily basis for every SKU, then in this case, any inventory control strategy remains possible. When no reorder needs to be made (according to the dedicated inventory optimization software), the Min quantity will be set at zero or even -1, preventing any reorder from taking place. When a reorder of X-quantity needs to be made and assuming that the total stock is S, then both the Min and the Max value should be set to X-S.
By following these rules, the default Min/Max behavior which is reorder to the max will perform exactly as instructed by the inventory optimization software that sits on top of the existing inventory management software. While it might seem a bit convoluted to have two distinct software systems for inventory management and inventory optimization needs, we have observed that these two issues should be addressed very differently. For more details, see our inventory control page. The quantile forecasting viewpoint offers a direct statistical calculation for the reorder points. From the Min/Max ordering perspective, when a reorder is to be made, both the Min and Max values should be updated with the reorder point value resulting from the quantile forecast calculation. Then, keeping both Min and Max values equal all the time would, in practice, lead to constant reordering every time any single unit is sold. In reality however, except for drop shipping situations, reorders are not made on-the-fly as soon as customer orders are received. Instead, reorders are usually made according to a pre-determined schedule. When a reordering schedule is present, it simply means that the Min/Max values should be zeroed the days where no reorder is supposed to take place for any given SKU. In this case, the information concerning the reordering schedule is integrated into quantile forecasts themselves directly through a chosen lead time.